The essential ingredient for winter gardening is sunlight. Do we have it in our community garden? Not really. In spite of this, we have enthusiastically planted out plenty of sun-hungry greens: spinach, silver beet, kale, broad beans and snow peas. 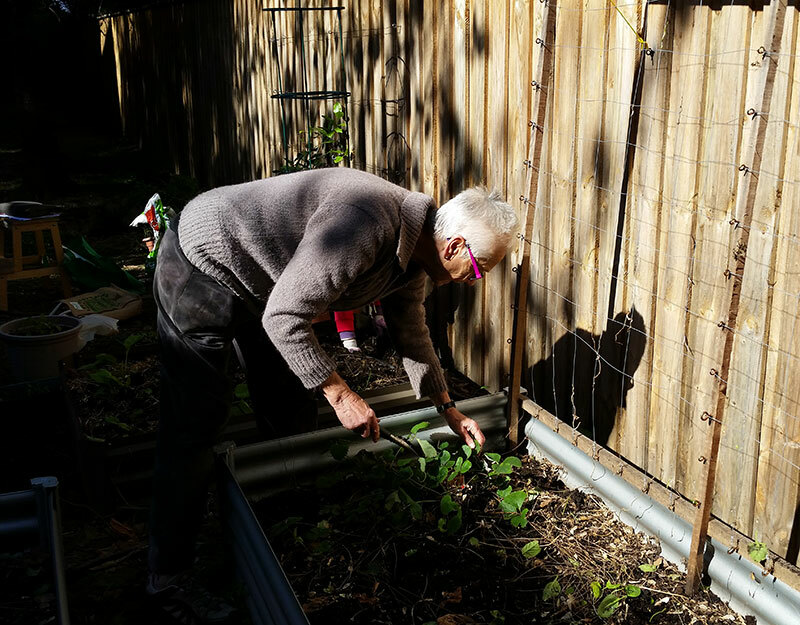 At our last working bee we transplanted the strawberries to another bed, uprooted the last of the basil, mulched and manured, tried to test the PH of the soil (results: inconclusive) and planted out our lovingly nurtured seedlings. Time for the strawberries to move to a home of their own. Then we realised that the fleeting sunlight that brightened up our labours was probably the only sun our babies were going to get all day. They were going to get nothing like the 3-4 hours that was recommended on the seedling packets — possibly even less than an hour. That was late May. On the upside, it’s rained a lot, so the seedlings have had plenty to drink. On the downside … it’s rained a lot, so they’ve had hardly any sun. It’s now early July, and amazingly, we have had a small crop of spinach. 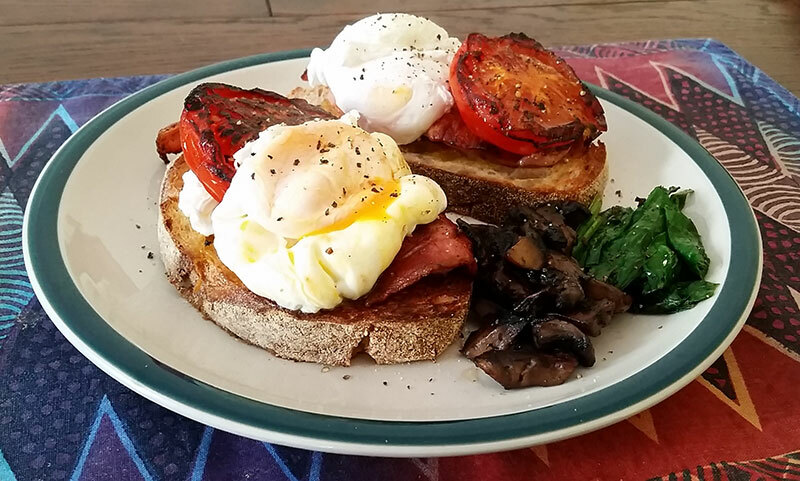 I cut some a couple of weeks ago and rapid fried it with garlic to go with bacon, eggs, mushroom and tomato in a cafe style breakfast. In spite of a string of overcast days since then, the plants already have quite a few more big leaves. Unless someone else gets to them first (we have a policy that if you see it’s ready, pick it) I have plans to use my next harvest in a recipe I found for Mauritian style salmon and spinach. My favourite way of cooking silver beet is to add young leaves to a mix of ricotta, egg and onion, wrap it in filo pastry layered with butter, and bake until golden. I prefer using young leaves because they don’t taste as acidic as the older leaves. I make it up as I go along but this recipe looks tasty, and similar to what I do. I chose to plant spinach and silver beet because they’re hardy and have a continuous harvest provided you keep on removing the larger leaves. I thought they would be ideal for a community garden because this means that everyone should be able to get a fair share — eventually. 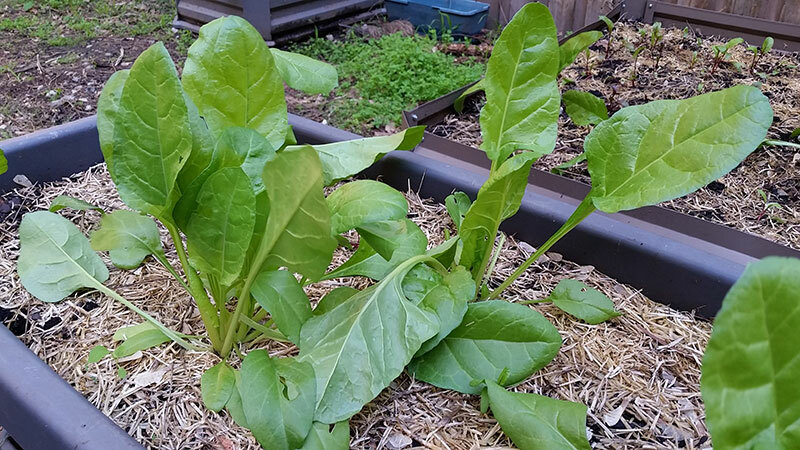 To be honest, the spinach had a head start on everything else, because I planted it out a couple of weeks ahead of the working bee. Nothing else is yet big enough to harvest, although most of what we planted has managed to struggle through the dark days and even put out a bit of new growth. I guess you could sneak a few baby beetroot leaves for a salad, if you were desperate. There is also still plenty of oregano and mint, which we planted last spring, as well as some parsley, watercress, and the occasional chilli. There’s even some self-seeded tomatoes, which have small green fruit on them. At least we are now past the winter solstice and the days will gradually get longer. I hope this will mean more sun on the garden and that soon all our winter greens will be not just surviving but thriving. Thanks for all your hard work – looking great. Yes, not doing too badly in spite of everything. Update: Last night I made the salmon & spinach dish – it’s sooo good. Looks good…we are heating up here in the states. Always on the lookout though for good ideas for winter. Happy gardening. Aaah…Australia? You are on the other side of the world where it is winter! It is summer here and quite hot. When it is winter in Virginia, USA, I will come to your blog for the warmth! Yes, it’s nice getting to look at other people’s warm weather gardens when you’re feeling cold, although in Sydney it’s usually fairly mild in winter compared to most of the USA.